One of the biggest myths about Robert Moses is that he was so powerful that he managed to build whatever he wanted wherever he desired. In reality nothing could have been further from the truth; Moses worked within political and economic realities and more often than not had to change his plans to satisfy elected officials, citizens, insurance companies, and other stakeholders. One project dear to his heart was the Brooklyn-Battery Bridge. If you have never heard of it, that’s because it never got built. The bridge would have gone fro the Manhattan Battery to Brooklyn Heights. It almost happened. Moses pushed the initiative through the myriad city agencies and managed to get Governor Herbert H. Lehman signed off on the measure. It took none other than President Franklin Roosevelt to quash the deal. 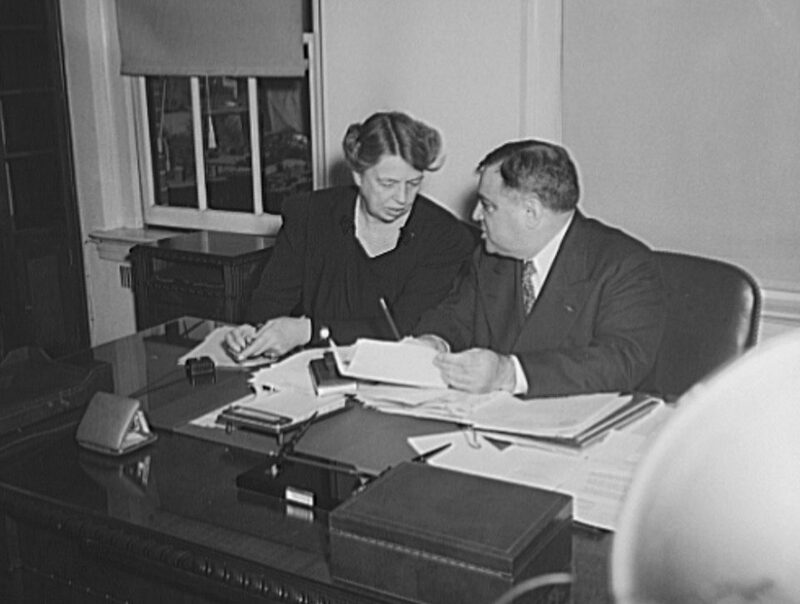 It was a personal thing with Franklin and Eleanor Roosevelt; they were New Yorkers who owned a house on East 65th Street, Franklin was briefly a Wall Street lawyer, and their Roosevelt ancestors had roots in the city dating back to the mid-seventeenth century. If you look at the rendering above, you see that the proposed bridge would have cut through the harbor directly north of Governors Island, still a major headquarters of the U.S. Army. Further north, in the East River, was the Brooklyn Navy Yard. Besides ruining the beautiful views Mrs. Roosevelt speaks of, there were national security implications. And that was how the president and his Secretary of War, Harry H. Woodring, killed the thing, declaring the harbor too important for national security interests to have such a bridge cross through it. The Brooklyn-Battery Tunnel was built instead. Wonderful stories, Keith! I’m so glad that you are teaching Moses this semester! Thanks, Bob. We’ve really enjoyed doing Moses and intend to continue. I have learned a great deal this semester. It’s such a layered story covering so many aspects of history.